After an adequate break in December i started my preparations for the upcoming season 2015, even though i was still a bit handicapped. But it was planned as an "easy" season anyways. Not to rest on my achievements, but because i knew it couldn't be any better, especially after the big surgery, the consequences of which i didn't know, despite the good progress. While everything went as planned on this side, there were very sad news in February. 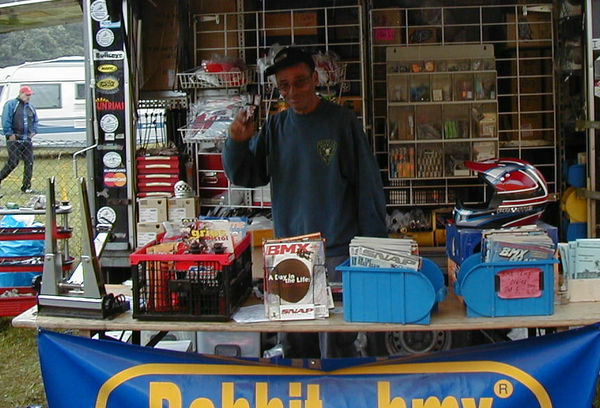 My long time friend, partner, former husband and also sponsor Wolfgang Fritscher (Godfather of Rabbit BMX) had passed away after serious illness and hard fight. Even though i knew about the illness, it hit me hard, since there still was that little glimmer of hope. He had a huge influence to my live, like only very few people in my surrounding, and in 16 common years he teached me countless useful things and gave me so much knowledge, and i am grateful for that. Only 3 weeks later, even more unexpected, my father in law left us as well, it's been really dark weeks, and he will be missed as painful as W.
But, what's left, You go on somehow, and finally everyday life is very helpful to get back to some normality, which is so important. It wasn't easy at the season's first races, since there were many one minute's silence and even more kind words. But i appreciated these gesture, even though it hasn't always been easy only a short time before the race started. Way earlier than expected i received green light for BMXing from the docs, but i still waited some more weeks until i did my first ride on the track. It felt right back awesome and worked surprisingly well. Well enough to compete in the first race of the regional series Baden-Württemberg Cup at Kornwestheim. This year i limited myself to races only at german ground, You can't always go at 120%. At regional level i almost always had to go with the men and soon experienced my first crash right onto my restaurated elbow. The scary moment was followed by immediate relaxation, because my elbow protection did it's job not only satisfying but excellent, and i was confident of going on with racing. I raced he regional championship in cruiser only and even against female competitors. Winning the title was my goal, and i reached it. Meanwhile i separated from my "job" as head of sports in my club, because i couldn't identify myself with/ didn't feel able to go the way they had chosen for the club. My criticism was not very welcome, that opened again my eyes who appreciates me because of me as person and only as long as You do the chore. But luckily i already know for a while who is real friend (the one who defend You even though You're not present), and who is not. Competing at the 3-Nation-Cup at Ahnatal had the purpose of checking and testing out the track for the german championships later that year. And of course, a competition is a very good training - tactics, full laps - who does it in training exactly like in the race? With the 5th place in the open female cruiserclass i was best of the 30+ year old ladies, that made me happy. In the Bundesliga/ national series i could get full points at Weiterstadt as well as Hamburg, everything went as dreamed of. I felt really comfy and save on my bike, i jumped a lot - and it really made lots of fun. And it was nice to be on the track together with all the girls and ladies, at all 8 Bundesliga races and of course in bavaria (as almost usual). the seasons' highlight was the german championship, and until that day we already had really hot weeks in Europe, and almost everyone sufered his/ her own way. But the Ahnatal crew did a good job, had several water spots for everyone, nobody had to suffer - at least not because of the heat. With good circumstances i was able to defend my title before a race break's been waiting for me. Watching only the world's races was a very new experience, and i didn't ever regret my decision. we had a great week with no nervosity etc. and in company of dear friends. the 2nd half of the season went as well as the first one, at regional races as well as the southgerman championship i was on top of the podium. We had lots of sunny hours and days, at least till the second last event. The last race was a Bundesliga-weekend, at Strudelbachtal for the first time ever. It was cold especially in the morning, a pretty good warm-up was unevitable. bending over my right ankle right before my very last lap was not planned, as well es not to damage my outer ligament. Somehow i managed to "forget" it during my race, that winter-break was near. I was again able to decide the series for my with mamimum points, after winning both finals at Erlangen (pic right) as well. After the weather was good or at least ok it was able to ride my bike a lot during winter, i am sure, this will show positive effects in spring time, when the races start again. Insgesamt waren schon 249793 Besucher (1018067 Hits) hier!